Our everyday lives are surrounded by different sounds. The ringing of your alarm, the buzz on the TV, your favorite tunes playing on your earphones, sirens, and honks, birds chirping in the park, people’s conversations – everywhere you go and whatever activity you engage in, you will hear sounds (unless, of course, you have hearing issues). Now, you may not notice it, but sounds have an impact on your body and state of mind. How do you feel when you hear a police siren? What sets the mood in a romantic dining place? Can you imagine how it would be like if you work out in a gym without any music? Sounds are powerful. They evoke in us certain types of emotions, and they can influence your disposition in an instant. Our ancestors have long recognized the power of sound; using beats for battle, for custom rites, and of course, for healing. The basis for sound therapy, in its entirety, lies in the belief that our body is inherently made up of vibrations. When vibrations lose their natural rhythm – could be due to stress, trauma and diseases – our body undergoes a kind of discord that can cause health issues. What sound therapy does is restore the natural flow of vibrations through the conscious application of certain sound frequencies. For instance, using gong sounds, the vibrations can bring an individual back to a state of complete harmony. Studies have found that using sound for therapeutic purposes can impact the brain waves, thereby encouraging body healing and restoration. A gong bath refers to being bathed in gong sounds. This doesn’t entail being drenched by water or any liquid; it just means you get to bask in the different array of gong sounds. If you’re like most, in the beginning, all you know about gongs is that they are used in cultural ceremonies. You may have seen one in a movie or TV show. Indeed, gongs have been around since the ancient times, being used in different rituals since its origin dating back to 3,000 B.C. 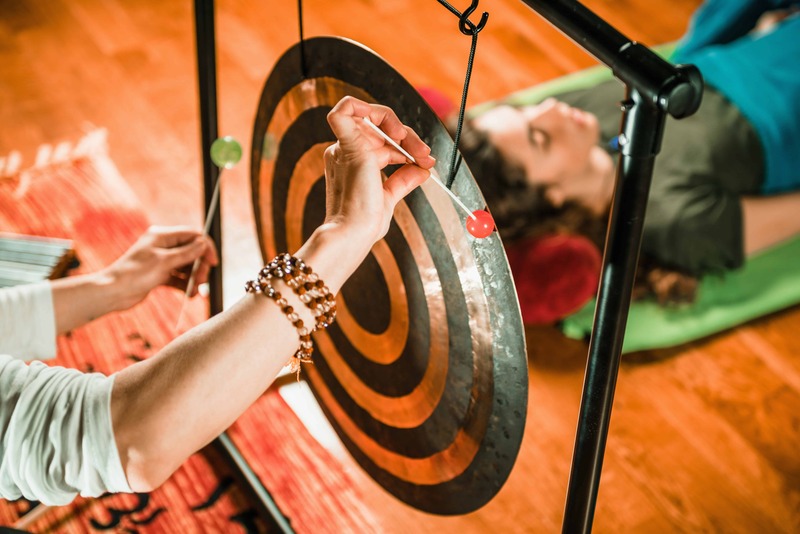 But there is more to the gong sound than you think you know; it is a predominant tool in sound therapy, which is a healing practice started thousands of years ago and still recognized today. In fact, modern science acknowledges the benefits gained from sound therapy, as it is well documented to have an impact on the physical and mental faculties of the body. The sound waves that a gong creates awaken our dermatomes – nerves that relay sensation to our entire body. Gong sounds help us reach a kind of meditative state, which can prove essential to easing pain and addressing other health issues. Gong baths have been associated with relieving headaches and migraines, physical injuries and other ailments. If you are interested in trying a gong bath, you may want to know what is involved in this practice. Before the bath starts, participants are informed by the gong master that a variety of sounds are to be introduced throughout the session. They are to expect that some sounds may have an unsettling effect, while other sounds may be pleasant. There are also silent moments within the session. Participants are asked to do a deep-breathing exercise before the gong bath starts. When everyone is ready and calm, the practitioner plays a combination of instruments that leaves participants washed in waves of sounds. Usually lasting for 45 minutes to about an hour, there is also a sharing portion after the bath where you can share what you experienced during the session. Gong baths are different from, say, a music concert, in that you’re not there to listen and react to the music. You don’t think about the sounds; rather, you allow the sounds to enter your deeper self and send you to a meditative state. When we encounter a stressful situation, our bodies automatically release stress hormones like adrenaline and cortisol as a response. Prolonged exposure to stress causes an imbalance to these hormones, which can cause high blood pressure, weight gain, depression, and insomnia, to name a few. Gong baths can be a way to combat the effects of stress. Sound waves can free up emotional blockages and even encourage damaged cells to self-repair! In one study, for instance, 100 gong bath participants mentioned that the practice significantly improved their psychosocial state, giving them a fresh outlook on their life and work. Gong baths can actually aid in treating anxiety, depression and post-traumatic stress disorder. The healing impact of gong baths is not only evident mentally; it can physically impact your body by stimulating blood flow, improving your breathing and lowering blood pressure. Some enthusiasts even mention that the therapy can improve certain chronic problems like spinal pains, migraine and other health issues. Gong baths have been documented as an alternative treatment for addiction. One gong master, Yogi Bhajan, used the therapeutic tool to help patients overcome substance abuse. As a gong bath allows a person to reach a deep meditative state, the practice helps you to be truly in touch with your mind and body. This enables you to take control of impulses, and go on to eliminate bad habits that unbalance your whole body. What’s amazing about gong baths is that you don’t have to ascribe to specific religion or beliefs in order to absorb its effect. Richard Rudis, a Tibetan Buddhist, explains that sound and rhythm is innate to all of us, “There are no prerequisites”, he says when it comes to experiencing sound therapy. You don’t have to study the ancient practice, nor prepare yourself for it. Whatever your background, all you need to do is be there and let the sounds wash over you.